While Neighbor Mrs. Montague’s are Blue. The Bard’s message of Love and Acceptance still rings true. 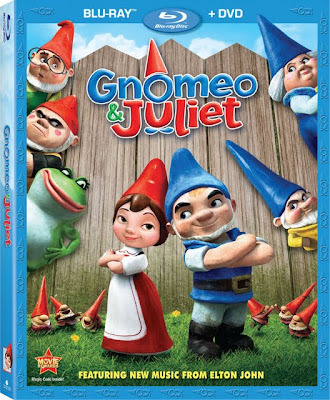 In Gnomeo & Juliet , the ongoing feud between rival neighbors plays out on the well manicured lawns of two households both alike in dignity in nameless British suburbia (as opposed to fair Verona) where Touchstone Pictures lays their animated scene in 2011’s upbeat interpretation of the Bard. Tired of being literally placed on a pedestal by her overprotective father (Michael Caine), Emily Blunt is eager to prove that her Juliet Capulet is far from delicate by embarking on a mission to kick some grass despite being made of glass. 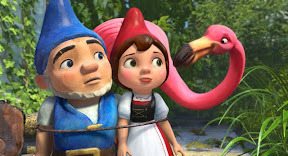 Accessorizing with a ninja black sock to hide her natural red, once she wanders away from the watchful eye of her gnome nonsense father only to fall under the admiring gaze of Gnomeo, Juliet’s stealthy search for an orchid quickly blooms into a secret garden of romance. 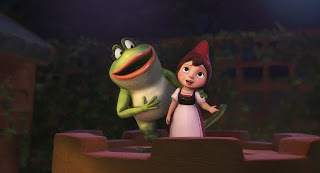 Discovering that their glass heart’s only love has sprung from their neighboring lawn’s only hate, the two sworn enemies – alike except in hat hue – must decide if they can love based not on the color of their caps but the content of their CGI character in this flawless high definition transfer of the theatrical hit. From a sassy water-squirting frog now on call for the nurse and a pink flamingo standing in for Friar Tuck, this years-in-the-making send up of the Bard trades in Juliet’s “happy dagger” for an overall happy tone. 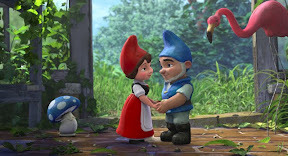 Infusing the Pixar -like animated cast comprised of ordinarily inanimate objects with DreamWorks style double-entendre filled dialogue, Gnomeo ’s screenwriters give us an endless amount of somethings rather than settling for a plot in which there’s much ado about nothing . 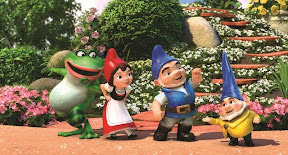 Though even Shrek 2 helmer Kelly Asbury can’t smooth out the rough transitions between far too many contemporary grown-up movie spoofs that reference everything from American Beauty to Brokeback Mountain to Forrest Gump , luckily the rapid-fire pacing and rat-a-tat wit of the delightfully well-intentioned Gnomeo & Juliet hits more often than it misses. And regardless of the fact that the ambitiously eye-popping endeavor was literally and figuratively a little too all over the place for its own good – having changed hands, studios and countries over a handful of years – the vital lesson of tolerance from the Bard’s source material ensures that much like a rose, a Romeo by any other name still smells as sweet. 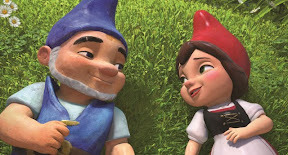 In other words -- as you like it -- all’s well that ends well once again for Shakespeare garden gnomes in love.